Asset Classes serve as templates that are used in the creation of Assets. Additionally, Assets can be sorted or organized by Asset Class. Asset Classes can be created manually, or imported through the Setup Assistant. Assigning an Asset Class is required during the creation of an Asset. Note: While an Asset Class is required to be assigned to an Asset, once selected, the settings and values can be updated as needed. Asset Classes can be created manually, one by one, or several at once through the use of a template. Click the 'Add Asset Class' and complete each field to create a single Asset Class. Click 'Export Template' to download the Asset Class Template. Complete the template in Excel and then save the Template. Make note of where you save the file as you'll need to browse there to select and import it. Next, click 'Import' to select and import you Asset Classes. 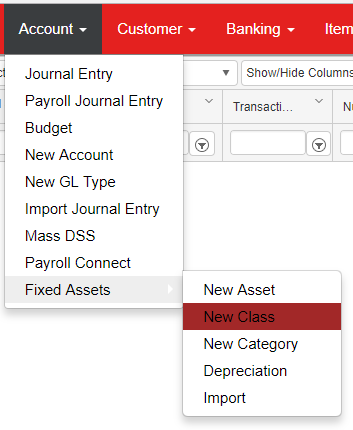 All existing Asset Classes will be listed in the 'Asset Classes' list in the 'Fixed Assets' subsection of the Accounting Module.